Why I’ve had a stomach full of people telling me how much running I need to do to burn off a mince pie. It’s that time of year again. Christmas songs on the radio, a calendar full of festive party invitations and ironically ‘bad’ seasonal knitwear. But in recent years, a new tradition has started to catch on. Rather than fill us with joy, however, this seemingly unavoidable new pretender to Christmas tradition is utterly devoid of festive cheer. Worse than that, from my perspective it’s both unhelpful and unacceptable. In fact, it’s damaging. 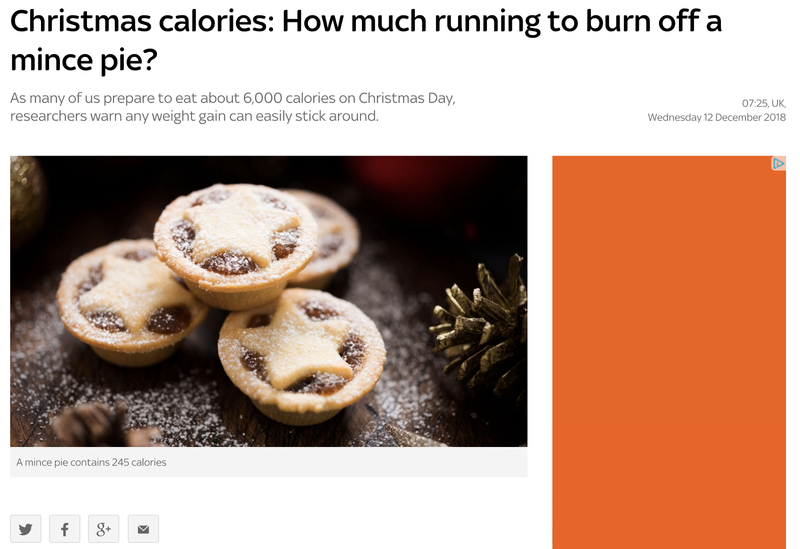 The inference being that for every calorie of Christmas dinner consumed you’ll need to run an ever-increasing distance or face an ever-expanding waistline. Before we sit down and tuck in to everything that is wrong with articles like this let me take a step back and explain what motivated me to write about it. I work for parkrun, the organisation that delivers over 1,700 community-led 5k and 2k running or walking events in 20 countries around the world. As the Global Head of Communications part of my role is to develop the language we use, so that people feel empowered to make positive choices, and then feel supported when they do. I’m ultimately responsible for the content parkrun produces on its blog, in emails, and across its social media. The pictures you see, the language we use, the stories we tell. But beyond the actual words we use, I help to guide the sentiment. What we mean by what we say. Who we are (and aren’t) appealing to. How what we say makes you feel. We’ve come to realise parkrun is a health intervention. It’s a run in the park, yes. But it’s also so much more than that. Through parkrun, people can and are becoming healthier and happier. We believe this so passionately that ‘a healthier happier planet’ has become our mission statement. Many countries around the world are experiencing a health crisis, with rising levels of illnesses such as diabetes, obesity and heart disease, which might be preventable (or reversible) by the things that parkrun offers. Our challenge now is therefore to bring parkrun to those who could benefit most from a community health intervention that offers physical activity, volunteering opportunities, skill development, fresh air, friendship and positivity, for free, every weekend of the year. Including Christmas day. And so we arrive back at the issue I’m having difficulty swallowing. We should never have to justify going for a run. When you suggest that something enjoyable (indulging in a few festive treats) should be offset by something else (exercise) in order to redress some kind of arbitrary balance, you make exercise a negative experience. When you therefore imply that physical activity is a punitive measure that should be done in order to atone for a ‘mistake’ or an ‘indulgence’ (like a community service order for the offence of tucking into the roast potatoes) you risk reinforcing fears and attitudes that are devastatingly difficult to overcome. Remember at school, when running laps of the field was served up as punishment? What kind of association with physical activity does that give a young person? The shame, embarrassment, struggle, loneliness and pain of it leaves a lasting impression. Exercise should never be used as a punishment. Is it any wonder generations have grown up equating running as something that must be endured rather than can be enjoyed? We see it every single day in our work. Someone registers for parkrun but doesn’t come along for weeks, months — maybe years — because they still feel all of these negative emotions. And yet the people who see exercise as a necessary evil, or who refuse to believe it would ever be for them, typically, have the most to gain from participating in positive, supportive, inclusive physical activity. They are the ones who have spent a lifetime thinking they can’t do physical activity. Being told it’s not for them. Fearing ridicule, failure and finishing last. The challenge we have in convincing them they can do it, that they are welcome, that parkrun is a place for people like them is enormous. Leaving aside the issue of using physical activity as the metaphorical stick to beat us with, increasing evidence is suggesting the ‘calories in / calories out’ theory of weight gain and weight loss is fatally flawed. The human body is complex. It stands to reason that some food and drink is better for us, some worse. That not all calories are equal. In any case, good health and wellbeing is surely the product of a number of different factors. Movement, social interaction, sleep, stress and of course diet to name just a few. Our lives are also complicated. Sometimes it’s easy following a ‘healthy’ lifestyle. We get in a good routine, everything is going well. Other times it’s more difficult. Something happens that throws everything out of whack. A job loss. Bereavement. Childbirth. A health scare. Sometimes it’s Christmas that upsets the routine. Sometimes Christmas is just the excuse we need to stop conforming: to relax and treat ourselves. The constant mantra of telling people what they should be doing, what they should be eating, how they would be healthier and happier if only they got off their sofa and did some exercise or made ‘healthy’ food choices does no-one any favours. One thing we can be certain of is that there’s little doubt that articles such as these are particularly unhelpful when it comes to disordered eating. Reinforcing (or affirming) a belief that the food we eat needs to be ‘earned’, ‘dealt with’ or ‘managed’, rather than simply enjoyed, has devastating consequences. This is never, ever, an appropriate message to communicate. It’s why you won’t see parkrun endorse cynical clickbait articles such as these. On the contrary — expect us to call for change. Organisations with an audience have a responsibility to communicate the many positive benefits of engaging in physical activity — without attaching guilt, blame or ridicule to the message. No one should ever lace up their trainers and do exercise just to ‘burn off’ something they’ve consumed. From the outside, those that do engage with exercise might appear to be part of some religious cult but physical activity is no form of self-flagellation. Run (or do any kind of physical activity) simply because you can. Do it to escape. To be free. To feel connected to your body and mind. To feel alive. Do it for whatever positive reason you want to — and take as much pleasure in that as you can. Christmas is a time for celebration, enjoyment, community and shared experiences. Physical activity can be all of those things too. Let’s tell the story of physical activity and Christmas united by joy. And let that become our new tradition. Trying to be a little bit better each day. Global Head of Communications @parkrun.